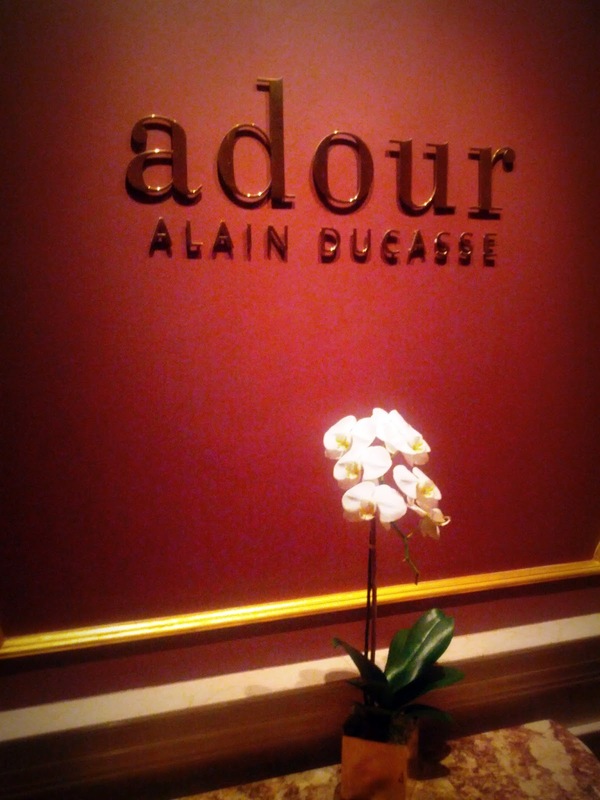 A few weeks ago, we had the pleasure of dining at Adour Alain Ducasse in New York. I was really excited because a) it has been on my NYC bucket list for some time, b) it's located at the St. Regis, and so we would be able to earn Starwood points for our meal, just as if we'd been staying at the hotel (check out this thread on FlyerTalk for more on that little-known fact), and c) we would each be able to take advantage of a special promotion that BA was running, offering a $50 statement credit for spending $50+ on your BA Visa at any Michelin-starred restaurant in New York ($50 x 2 = $100 off the final bill!). I only had a few days at home in between my trips to Italy and China, and what better way to spend a Saturday night? Before ordering, we had a glass of Lanson rose champagne. I've started to appreciate a nice rose more and more over the past few years, and this was certainly a nice rose. A light, refreshing start to what was about to be a very rich meal (for one of us at least). We opted to order one tasting menu and one vegetarian tasting menu, which allowed us to both sample 10 different dishes! Whenever we're ordering tasting menus, I'm never worried about having enough volume of food - so we often try to get as many different dishes as much as possible. Twice as many tastes, just half the portion size for each one! Before our first courses arrived, we received a tasty fried cheese appetizer, as well as our amuse bouche - candied beets and melon, with a tomato gelee. 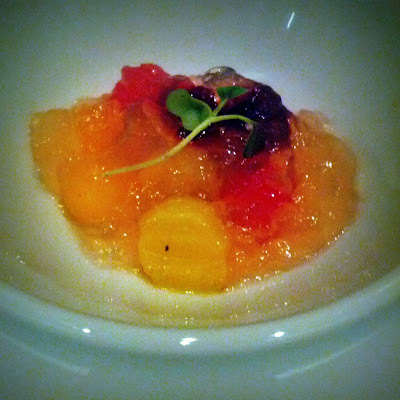 All of the individual flavors were very apparent, and it made for a really interesting combination. A tasty and refreshing start to the meal! 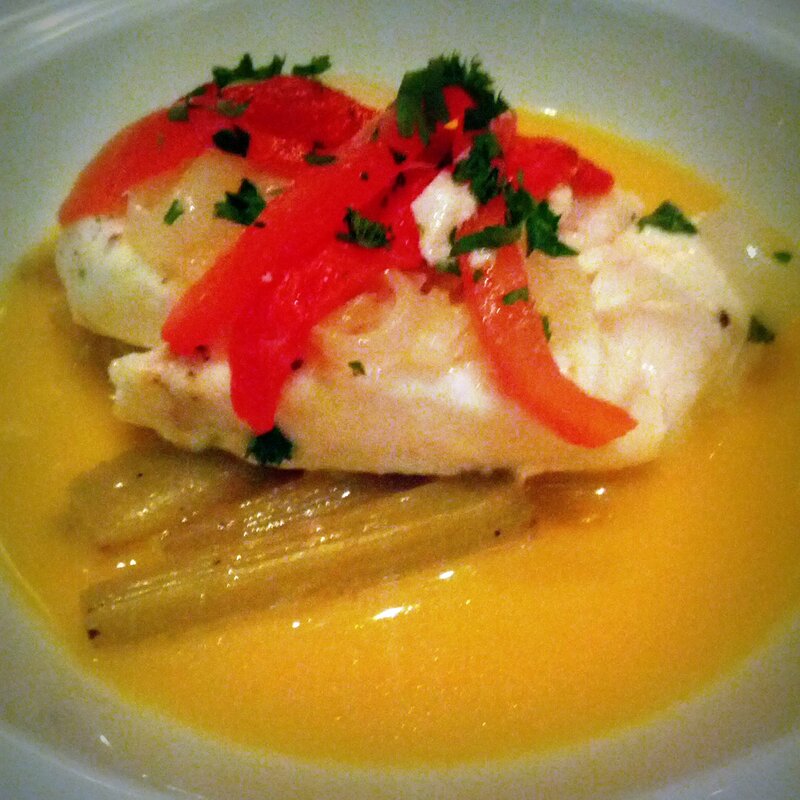 To start the meal itself, we ordered a bottle of Pascal Jolivet 2010 Sancerre. It was a very crisp, refreshing Sauvignon blanc - a perfect match for the first few courses. My first course was salmon "a la Parisienne", hers a chilled garden pea soup. The salmon was quite nice, but for me, round one went to the vegetable tasting menu! The soup was extremely fresh tasting, and intensely flavorful. I don't know that I'd ever had a chilled pea soup before - but I'll definitely be keeping my eye out for it when peas are back in season! 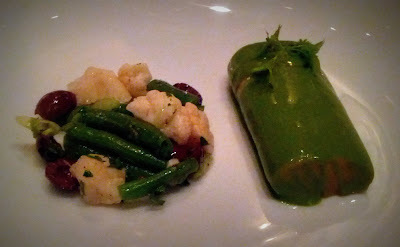 The second courses were veal sweetbreads, and stuffed zucchini blossoms. 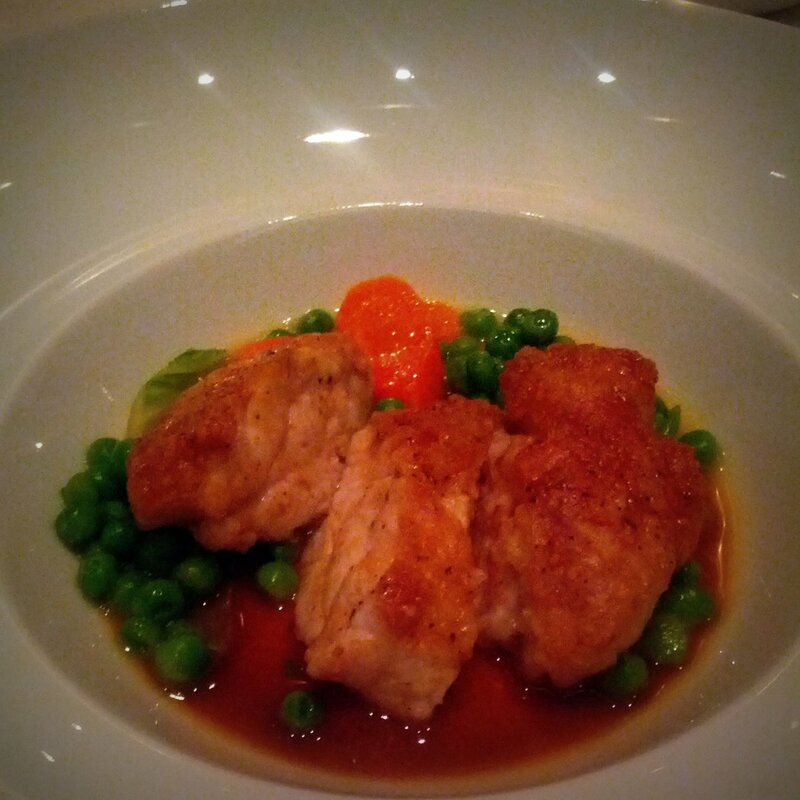 The sweetbreads were easily one of my favorite dishes of the entire meal - rich and full-flavored, with crispy, fried bits on the outside. It was surprisingly rustic compared to the rest of the meal, but that's my kind of food anyway. The sauce and vegetables that came with it were a perfect match - and if the portion had been just a bit bigger, I would've been happy to have it as my entire meal! 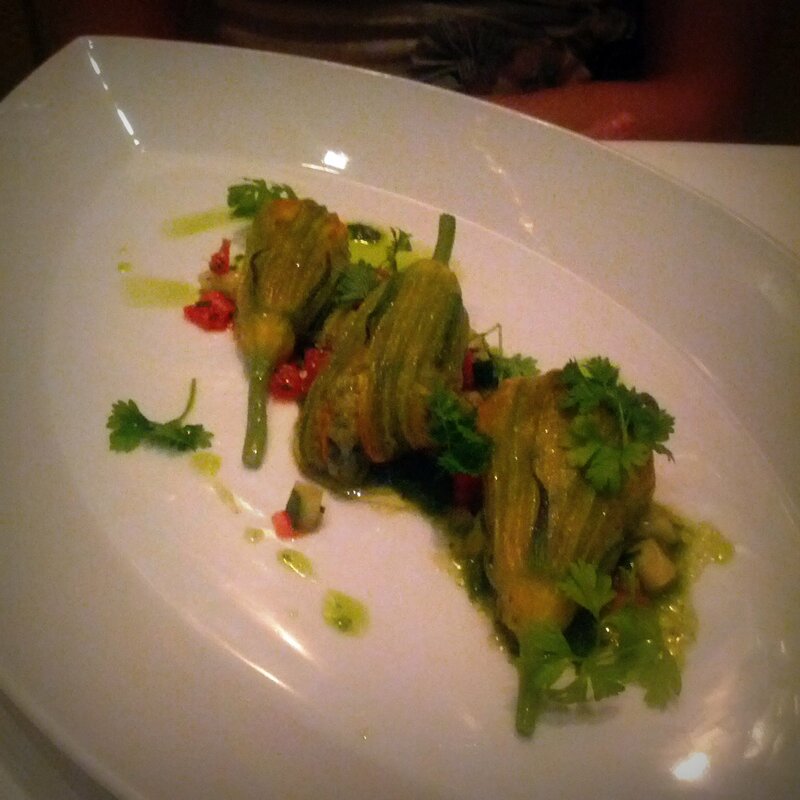 The zucchini blossoms were also very tasty. In case you've never had zucchini blossoms before, they taste like... zucchini. It was a nice dish, and the presentation was very pretty - but the sweetbreads took this round by a wide margin in my books. For the third course, we had the halibut and a mixture of cooked and raw garden vegetables. The fish itself was fine - but the sauce made the dish special. It was intensely-flavorful, but didn't overwhelm the otherwise delicate dish. The vegetables were also quite tasty for something so simple (truffle dressing will do that, I suppose), but due to that sauce, I'm going to have to go with the fish for this round. My final savory course was supposed to be a roasted duck breast. While I was looking forward to it, I wasn't exactly disappointed when they had to make a substitution to the menu, and I received the beef cap with Bordelaise sauce and bone marrow instead. 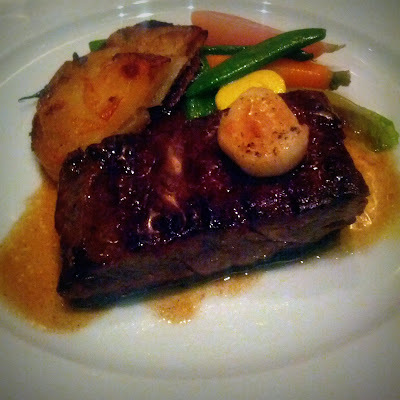 It was everything I would've expected from a French beef dish - salty, meaty, and in many ways, just primal... but it was also refined, and I found it more well-balanced than your typical high-end steakhouse steak. 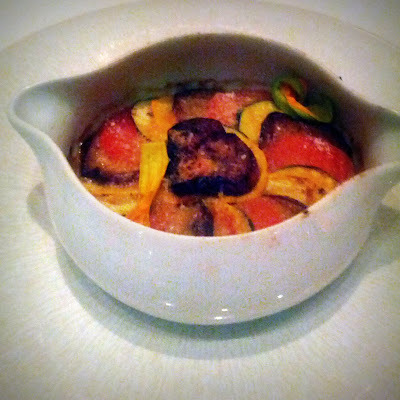 The cookpot was prominently featured on the a la carte menu, so we had high hopes. It closely resembled a ratatouille, and while it was quite tasty, I didn't think it lived up to the hype generated by the menu. Round 4 to the beef! For dessert, our tasting menus came with a Peach Melba (regular tasting menu) and a Raspberry Verbena Vacherin (vegetable tasting menu). Both were good, but my favorite part of the end of our meal were the extra treats that came alongside our desserts! 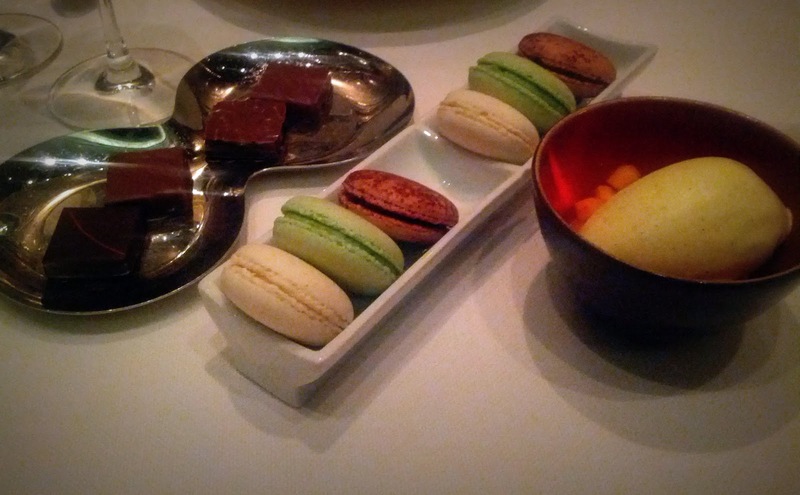 The macaroons were my favorite (particularly the pistachio ones), and I must say that I do love how fancy restaurants seem to have a tendency to throw in surprise additions at the beginning and end of the meal. I have no doubt that it's worked into the price of the menu items, but it always nice to have a surprise at the end - especially when that surprise involves macaroons! What are some of your most memorable meals? Any particular restaurants (in NYC or elsewhere) that I should make a point of checking out?